Human Umbilical Cord Mesenchymal Stem Cell Growth Medium consists of Human Umbilical Cord Mesenchymal Stem Cell Basal Medium, Fetal Bovine Serum and two supplementary factors. In comparison to traditional growth medium, which lacks the two supplementary factors, this product can support the human wharton's jelly derived umbilical cord mesenchymal stem cell to expand more rapidly, and proliferate more passages. 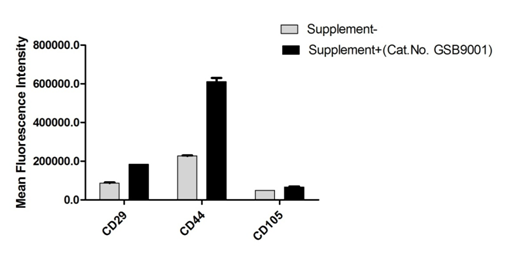 The expression level of typical mesenchymal stem cell markers (such as CD29, CD105 and CD44) of cells in this growth medium were significantly higher than that in traditional growth medium, and these cells keep the ability of differentiating into osteoblast, adipocyte and chondrocyte. 1.Prior to use, thaw the Fetal Bovine Serum under refrigeration (2 to 8°C) until completely thawed. Note: Flocculent precipitates may occur after thawing, which is normal, and does not affect the usage of fetal bovine serum. 2.About 10 minutes prior to use, thaw Supplementary Factor Ⅰand Supplementary Factor Ⅱ at room temperature until thoroughly thawed, centrifuge the vial before opening. 3.In a laminar flow hood ,gently mix the Fetal Bovine Serum, Supplementary FactorⅠand Supplementary Factor Ⅱ to ensure homogeneity, transfer the entire amount of them into Human Umbilical Cord Mesenchymal Stem Cell Basal Medium, mix well and ready to use. Note: Prior to use, the complete medium should be warmed at room temperature for 30 to 60 min and protect from light, avoid warming it in 37°C. The Human Umbilical Cord Mesenchymal Stem Cell Basal Medium can be stored for up to one year at 2-8°C. 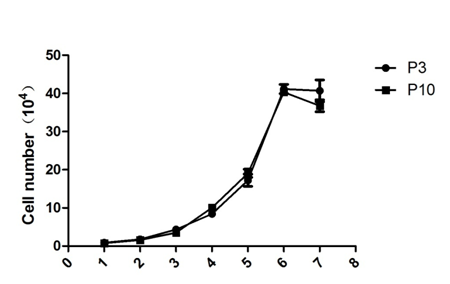 Fetal Bovine Serum and Supplementary FactorⅠis stable at -20°C for up to two years, Supplementary FactorⅡis stable at -20°C for up to one year, repeated warming/cooling and freeze-thawing should be avoided. The exact expiration date was labeled on the bottles. Once prepared, the complete medium should be stored at 2 to 8°C in dark and used in one month.